That was my week that was…. I’m no great admirer of Gordon Brown, but once again you have to feel sorry for him. His visit to New York for the UN General Assembly and the historic Security Council meeting chaired by President Obama was in many ways a personal triumph: he was widely hailed as the architect of the global response to the recession, “honoured as world statesman of the year at a VIP-packed gala dinner at which the award was presented … by the veteran US former secretary of state Henry Kissinger”; he earned international respect for a major speech to the General Assembly containing concrete initiatives on climate change, terrorism, nuclear proliferation, poverty and shared prosperity, and was a co-sponsor of the historic Security Council resolution, unanimously adopted, calling for a world without nuclear weapons. A few days ago he was in Berlin developing a new initiative on Afghanistan with the Chancellor, Angela Merkel. Yet he comes back from New York to be vilified by the media because there wasn’t time for a formal bilateral meeting with President Obama — whom Brown sat next to (or only one seat away) in the Council. 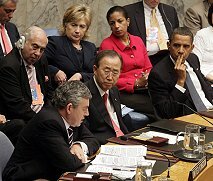 Obama inevitably took advantage of the presence in New York for the UNGA of numerous world leaders to talk privately to those with whom his contacts are rare. He and the UK prime minister meet often and talk on the secure telephone even more often. Yet even the Guardian treats us to a banner headline proclaiming that Obama has snubbed the unfortunate Gordon. Truly, no man is a prophet in his own country. Fair enough to take Brown as we find him, warts and all: but the UK media never seem to notice anything but the warts. Earlier in the week I was stopped and searched by an extremely courteous police sergeant under the infamous Article 44 of the Terrorism Act 2000. I had just emerged, with my wife, from Green Park tube station; we were walking through the park on our way to have lunch with some old friends from university, all of us septuagenarians. Under section (3) of Article 44, authority to stop and search anyone “may be given only if the person giving it considers it expedient for the prevention of acts of terrorism“. The sergeant smiled drily at my speculation that I had been singled out for this treatment because of my beard, presumably an almost infallible pointer to terrorist proclivities. A search of my back-pack failed to reveal a bomb, but the sergeant was pretty suspicious of my sachets of powdered sweeteners (“Splenda“, actually: strongly recommended). I suppose any copper must hope to have hit pay-dirt when coming across white powder in a beardie’s rucksack. He took my wife’s word for it that it was only sweetener, and refrained from tasting it. There followed a fairly lengthy ritual of identification, the policeman laboriously copying details of my driving licence, the time and location of the search, and the provision of the Terrorism Act under which he was acting, onto elaborate forms. He gave me faint, barely legible copies of these, “in case you wish to lodge a complaint against my conduct or against the system, Sir”. I assured him that I had no complaint against him personally: his conduct had been impeccable. As for the system, I had already made vociferous public complaints against it ever since the enactment of the pernicious law in question. I assured him that I would continue to do so. So I must assume that my name and details are now irrevocably recorded in some police database under the heading of ‘terrorist suspects’. Not really funny, I suppose. I was glad to see a letter in the Guardian on 22 September (I can’t find it on the website) making the points, not to my knowledge made elsewhere in the media, (1) that the ‘fine’ of £5,000 imposed on Baroness Scotland, the Attorney-General, by a government body called the UK Border Agency for her failure to make a photocopy of the passport of her Tongan housekeeper was ludicrously and disproportionately severe considering the laughably trivial nature of her ‘offence’ (it’s not even a crime); and (2) that things have come to a pretty pass when British citizens can be arbitrarily fined to the tune of thousands of pounds by a government department without any vestige of due process. Another unpleasant feature of this non-event has been the opportunistic rush by the Tory shadow home secretary and his LibDem counterpart to demand that Patricia Scotland should “consider her position” — mealy-mouthed Westminsterese for “resign as Attorney-General”. And yet another unpalatable aspect is the fact that the law imposes on all of us this mad duty to photocopy the passport and other documents of any foreign person whom we employ, in a brazen attempt to make us do the UK Border Agency’s work for it. The UK Border Agency has acknowledged that Lady Scotland had not “knowingly” employed an illegal worker, and had “taken steps” to check her housekeeper’s documents, so her sole offence was the failure to photocopy them. Did the opposition spokespersons hollering for her resignation raise any objection to this barmy and oppressive provision of the Immigration, Nationality and Asylum Act 2006 when it was scrutinised by parliament? If not, they should shut up. 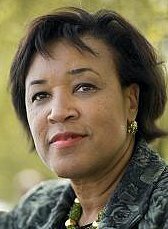 It’s especially sad that all this should cast a shadow over Patricia Scotland’s distinguished career (thanks to the Daily Mail, needless to say) when hers has been such an inspiring example of sheer talent and hard work, taking a girl from Dominica in the West Indies, the tenth of a family of 12 children, to Britain as a young black immigrant, to a starry career as a barrister, to ministerial appointments and a seat in the House of Lords, and then on to the position of the government’s principal legal adviser with the right to attend Cabinet. The Daily Mail and those demanding her resignation must feel very proud of themselves. Continuing down through Green Park after my brush with the law, we cut through to Pall Mall via the passageway leading past Bridgewater House, one of the magnificent buildings lining the side of the park. Designed by Barry in 1847 for the Earl of Ellesmere, the house is still privately owned, unoccupied most of the year other than by a caretaker and his wife. This week, however, it was the centre of vigorous activity, as dozens of workmen dismantled a gigantic stage, supported by extensive scaffolding, over the grounds between the house and the park, and laboured to remove the massive cantilevered steel canopy that had been erected over it. The stage and canopy had been built, so we gathered, for a party last weekend for some 400 people, given by an unnamed host who was staying at the time at the Ritz, just at the top of the park. It had taken more than two weeks to build these massive structures, and seemd likely to take at least another two weeks to dismantle them and take them away. No doubt some restoration of the grounds underneath will also be necessary. I just thought you’d like to know. It must have been some party. Brian – my guess is that you two suspicious characters were stopped outside Green Park station to make the police statistics look better by showing that some Caucasian, non-black or people of similar description were being searched and not just blacks. Or is that too cynical? As for Baroness Scotland, I agree about the fine being imposed without any trial. My first thoughts were that if the offence were so serious as to merit a £5,000 fine then she should go. But then I wondered whether the size of the fine was merited – and I do not think it was. That said, the lady should have been super-meticulous in making sure everything was hunky-dory. Don’t Ministers and/or their advisers know that the media are going to seize on anything that looks out of line. If they don’t understand that, then it is about time they did. Isn’t that what advisers in particular paid to do among other tasks? Brian writes: Thanks for this, Gerry. I’m sure you’re right about my selection as a useful statistic for stop and search, not being a young black male — although on that reckoning my wife would have been an even better bet! We agree about the disproportionately steep fine imposed on Patricia Scotland. I suspect that once the Daily Mail had fingered her, the Border Agency will have added a couple of zeros to the fine to protect themselves from the accusation that they were letting this ‘offender’ off lightly because she’s the Attorney-General. That kind of reverse discrimination, if that’s what it was, is unconscionable. As for the responsibility of her special advisers for making sure everything was hunky-dory, I’m not sure if they have any jurisdiction over domestic minutiae such as making copies of the housekeeper’s passport! In Lady Scotland’s case, well up to a point Lord Copper. She has been closely associated with the Government’s crime factory and indeed took the Act in question through the Lords so, whilst acknowledging the possible disporportionate level of the fine, is this not a case of the boomerang coming back on her Ladyship’s head or reaping what she has sown? Your reference to being searched as an obviously suspicious character surely highlights the Home Office’s diligence in creating offences and in endowing the police with ample scope for officiousness. It’s a good job you weren’t carrying a camera. I’m afraid the incident is damaging to the government since it shows what is to my mind a cynicism about what they have done to create an illiberal society and the same tendency to cling to office as in the decadent days of Major’s government. The pity is that this will simply add to public distaste. Brian writes: Richard, thanks. I agree that there’s a certain poetic justice about the then home office minister who steered the relevant legislation through the Lords finding herself a victim of one of its more ridiculous provisions. But there can’t be a case, surely, for demanding that she resign as Attorney-General, not in fact for omitting to photocopy her housekeeper’s passport (having meticulously honoured all her other obligations in the procedures for employing her ), but really as an additional punishment for having been associated, as a junior home office minister, with a stupid and ill-conceived piece of legislation three years ago. The Order bringing the Act into force was signed by Liam Byrne, the then home office Minister of State who presumably had overall responsibility for the legislation within the home office team. The home secretary responsible for the genesis of the Bill, although he was sacked just before it came into force, was Charles Clarke, who should be blamed for it (if anyone should) rather than Lady Scotland. But the ‘offence’ for which her resignation is being demanded, and for which she has been administratively but not judicially fined, is the failure to photocopy a document, not the offence of having been procedurally associated in a quite different capacity with an objectionable law more than three years ago. A £5,000 fine for that trivial omission is already out of all proportion: to demand an end to her ministerial career as an additional punishment verges on vindictive witch-hunt. At best it’s opportunistic party politics without a human face. If Lady Scotland is finally hounded out of office by this baying mob, on such flimsy grounds, it will be the ultimate demonstration that politics, as Alan Watkins occasionally remarks, is a rough old trade. I hope you and your lady hadn’t been foolish enough to exchange a few words in distantly-remembered Amharic in the presence of a policeman near an Underground station: a language possibly mistaken by the officer for Arabic, Farsi, Urdu or Pushtu. Brian writes: Ah, there’s a possible explanation, Tim. It’s unlikely to have been Amharic, a language with which I confess I failed to make much progress; none at all, in fact. But a quick exchange between us in Russian or Polish might have rung alarm bells in the way you suggest — or even Strine! I have noticed a marked propensity on the part of police forces (or pseudo police forces) everywhere to fill their quotas with easy targets. I think we can assume that said sergeant didn’t feel in physical danger when he took this initiative and engaged the infamous Barders. In Beirut during very tense times in the early 1980s, I was heading for dinner in a Norwegian embassy car with CD plates driven by a female first secretary. At some roadblock, all the beards and hairies were let through whereas our car, with a snowmaiden at the wheel and her grinning blond boyfriend next to her, was pulled over and rigorously searched. They didn’t even find any white powder, let alone the AK-47s and RPGs that were probably in all the other cars. Likewise, in Paris, I once saw the joy with which three (yes, three) police officers arrived to deal with the problem of a barking dog (a pint-sized Cavalier King Charles, not a Rottweiler). I heard one of them triumphantly call the station to say the problem was resolved. Rather than stick the owner with a fine or rough him up, they shook hands with him and used the occasion to take a little walk. A half-hour with no confrontation with yobs, at least. Brian writes: Thanks indeed for these splendid vignettes, Julian. You’re absolutely right that the nice police sergeant displayed absolutely no fear of either my wife or myself during our encounter; not surprisingly, considering my advanced age (I refrain from comment on that of my wife). In any case, even if the sergeant had felt in the least intimidated by the compliant old buffer whom he had picked out to stop and search, there were at least 20 other coppers in the immediate vicinity, standing around on the grass in the sun doing nothing in particular, so he could easily have called for reinforcements had he judged that he might need their help to subdue me. Did Lady Scotland really carry out the proper checks, as it seems she was legally obliged to do, on Loloahi Tapui’s documents? These documents were either in order or they weren’t. If they weren’t, surely her ladyship was wrong to employ her? If they were, then wasn’t she wrong to sack her? Brian writes: As I understand it, Ms Tapui’s passport turned out to have been either forged or otherwise tampered with, but it appeared to be in order and no-one has blamed Lady S for failing to spot the tampering. I assume that considerable expertise, and perhaps special equipment, would have been needed to discover what was wrong with it. Lady S only sacked her when she was told by the UK Border Agency, which had been tipped off by the Daily Mail, that Ms Tapui was not entitled to work here and had a dodgy passport. It seems that Ms Tapui is married to a bona fide British citizen (a solicitor, I think?) and could probably have got a residence permit with permission to work here had she applied for it (although the dodgy passport might have been her undoing if she had). The whole thing has been a tragedy for both of them. Opposition spokespersons’ and the media’s unconcealed glee at the opportunity to demand the resignation of a member of the government has been distasteful at best. Did Lady Scotland really carry out the proper checks on Loloahi Tapui’s documentation, as the law apparently requires? If they weren’t, wasn’t her ladyship wrong to employ her? If they were, why did she sack her? Is it really so easy to forge this kind of documentation, so difficult to see what what’s wrong with it. If so isn’t all this lovely legislation a bit futile? Brian writes: I don’t know, John. I’ve never tried. Obviously I don’t know either, which is why I asked the question. Believe that and you’ll believe anything. Brian writes: Believe anything you read in the Mail on Sunday (or on any other day) and you’ll believe anything. I don’t like the Mail much either, but if they’re actually lying there’s every hope they’ll be taken to the cleaners. Such defences as “I acted in good faith,” or “I made an inadvertant error,” don’t cut much ice in the libel courts. You have to be pretty stupid to libel any competent lawyer, let alone the Attorney-General. Iif you’ right – as I’m sure you are – to say it needs sophisticated gear and techniques to do the job properly, what chance have ordinary employers got of adequately complying with her ladyship’s law?